I created this in Picmonkey as I do all my invites and printed them at Target. They turned out perfect and my only regret is that I made the bottom text a bit too small. This is my baby sister and she is having a baby! Ok right, you knew that already, however can you believe that she is 32 weeks pregnant in this picture. She is super tiny and beautifully pregnant. To bring a little more ump to that bump, I made a sash out of a ribbon and added some flowers using hot glue. She looked fantastic. We went with a simple but full menu. 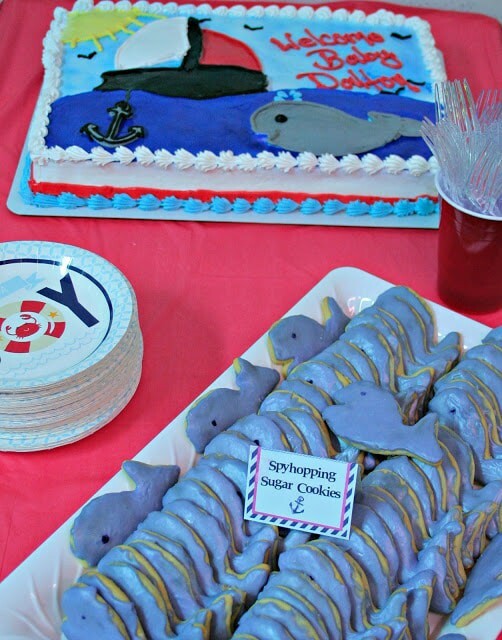 I paired with my sisters Mother-In-Law and my mom to put together the whole party and had little to do with the food. It was actually wonderful to not have to worry about that part and I am so thankful for my sisters mother-in-law and my mom for all their help. We had a lot of food but these “crabwhiches” were a huge hit with 3 types; chicken salad, tuna salad and egg salad. 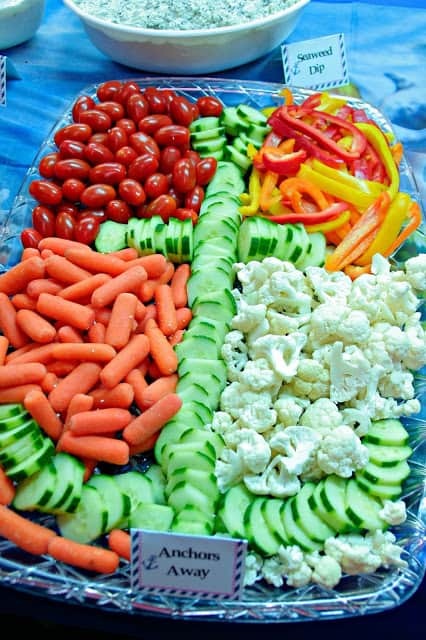 This anchor veggie tray was awesome and got so many compliments. That seaweed spinach and artichoke dip was so scrumptious. Take some ranch and add a clever little bell pepper octopus and you have vegetarian calamari. My mom carved two separate watermelons. 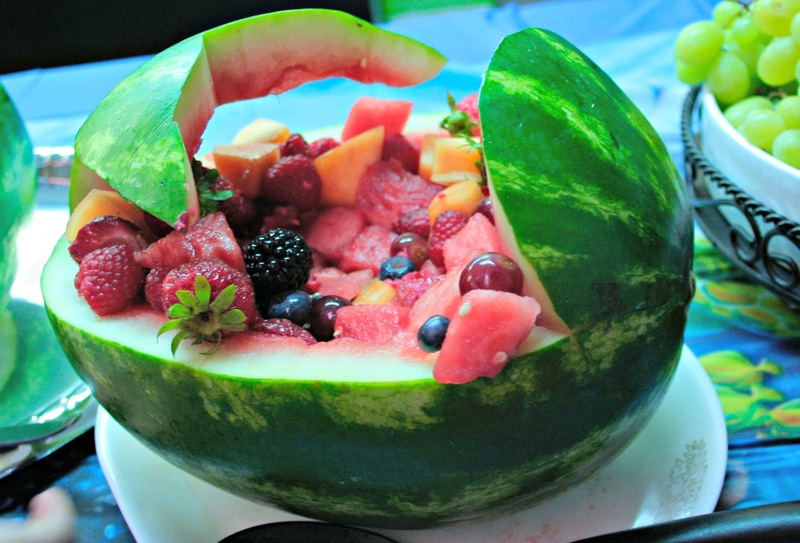 This one is the cute little whale and there was also the typical baby melon. So very good and perfect for our theme. For the sweets we went with a Target cake (because their whipped buttercream frosting might as well be crack) and my brother-in-laws favorite sugar cookies that his mom makes. 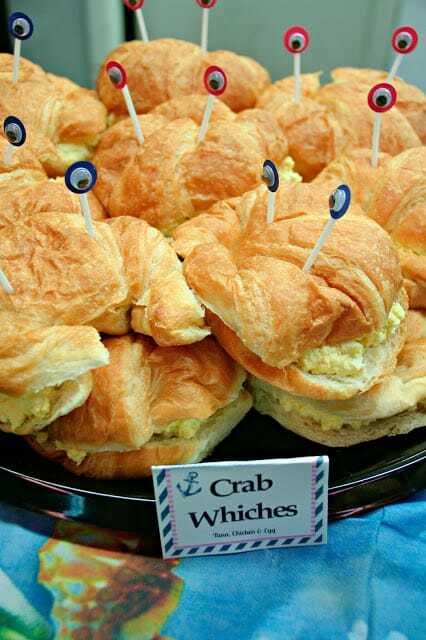 Seriously those were amazing. I also ordered the most adorable oriental trading baby shower plates and napkins with the baby shower nautical theme. 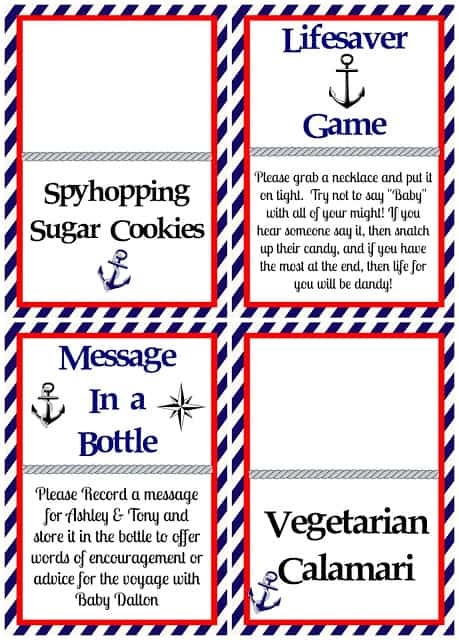 I made several different food tags and game directions that I thought I would make them available in printable form. All you need to do is either click here or on the picture above to access the folder. Oriental Trading Baby Shower products came to the rescue for our decor. They had everything I needed to keep our theme going. 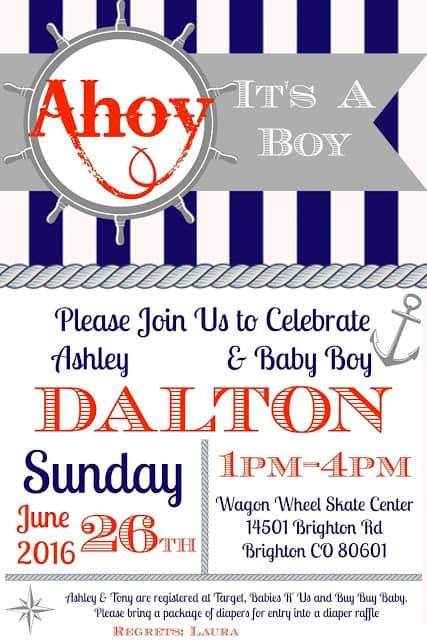 We ordered the Nautical Baby Shower Decorating Kit that came with the anchor garland, the Ahoy table signs, the paper wall cutouts and the honeycomb balls. We found an old wooden oar and sanded it down to use as the sign in book and this main table was where the games were. Thanks to a wide variety of Oriental trading party themes I was able to order the fish net as well. 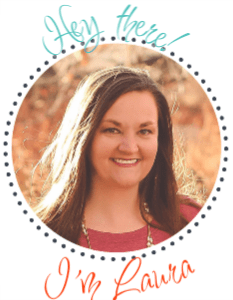 They were the perfect price and really brought the room together. 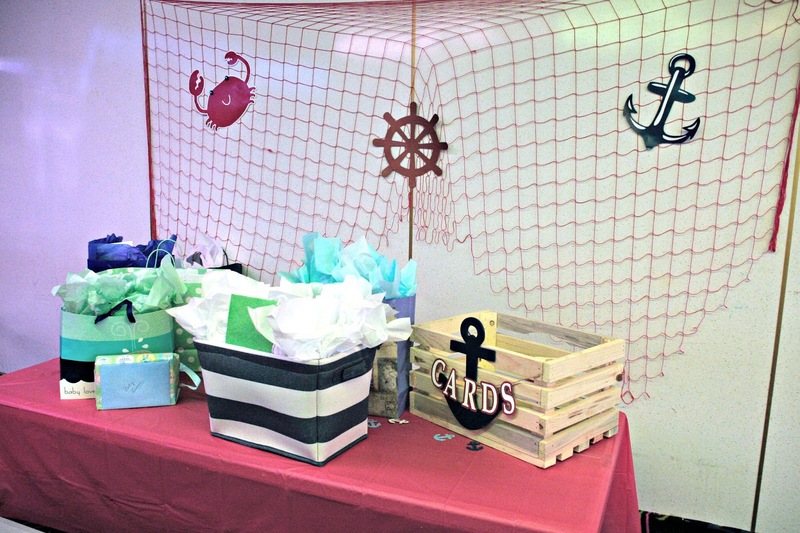 Oriental Trading Theme Parties have a HUGE selection and I loved all of nautical baby shower decor and ideas. 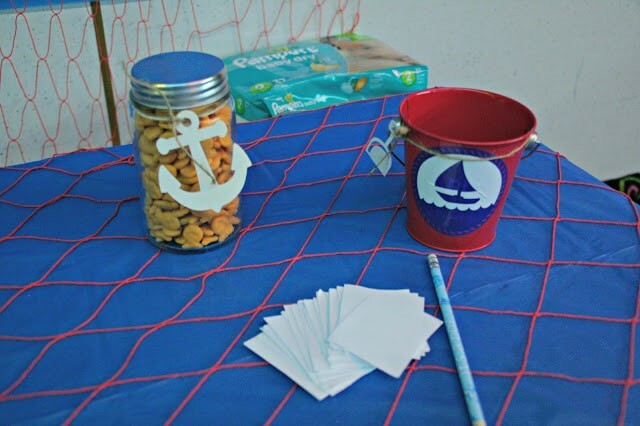 For the table centerpieces I used my Silhouette machine to cut out some nautical vinyl and then cut the shovels out of card stock and attached both to the metal buckets. 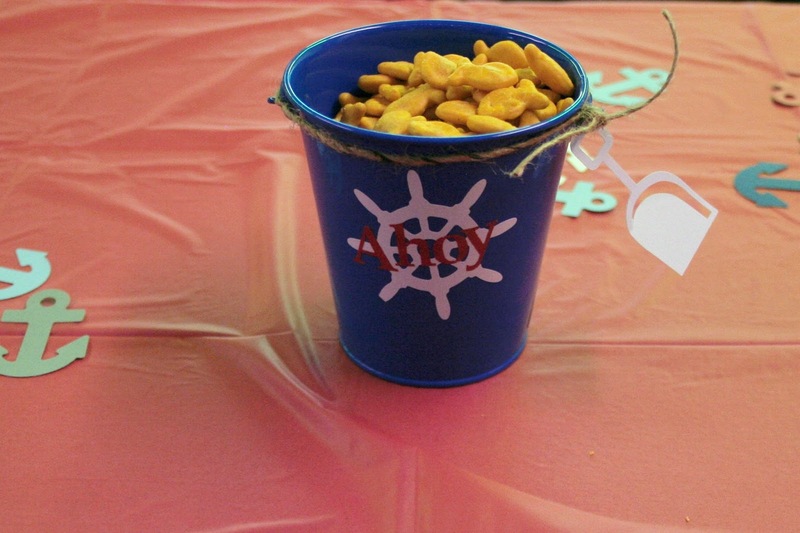 We filled each bucket with goldfish and chips and then put them on the center of the table with a bunch of anchor punch out confetti. My sister is not super big on being the center of attention, so we tried to keep the entire shower very low key and the games light hearted. 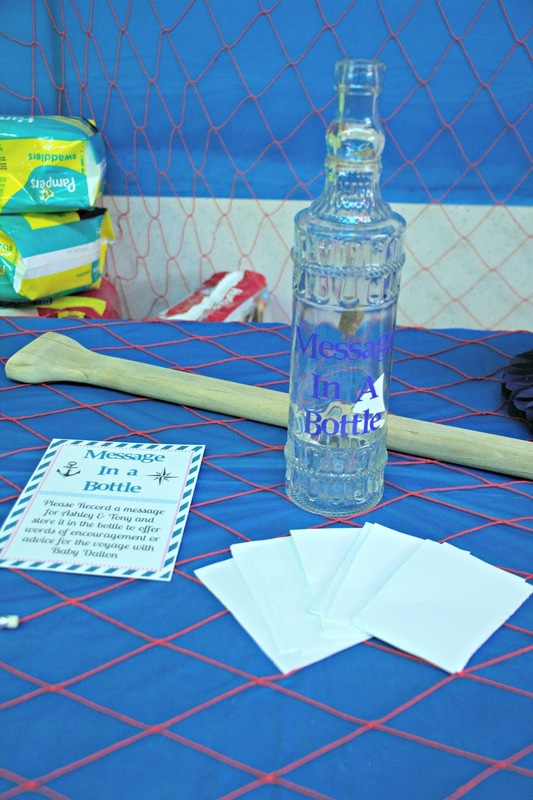 I made this message in a bottle for friends and family to share their words of advice for the new parents. We also had a guess the goldfish in the jar game. There were 215 goldfish in the jar and one person was only 2 goldfish off! For gift bags we gave the winners a Starbucks gift card and a variety of Mars candies! 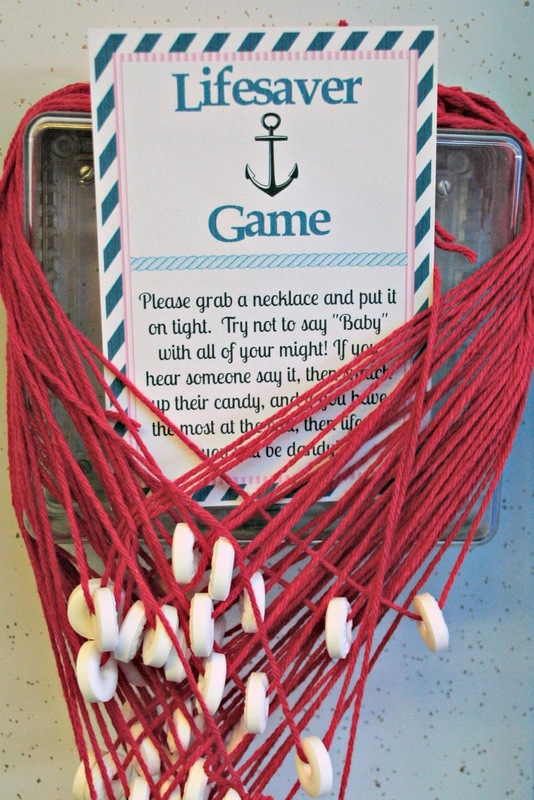 A variation on the clothes pin game where if you say baby you lose your pin, we went with lifesavers. It was a fun little game but mostly the kiddos at the party had a great time eating the lifesavers! Overall the party was amazing. We had a wonderful time celebrating the parents-to-be and showering the new baby with love! 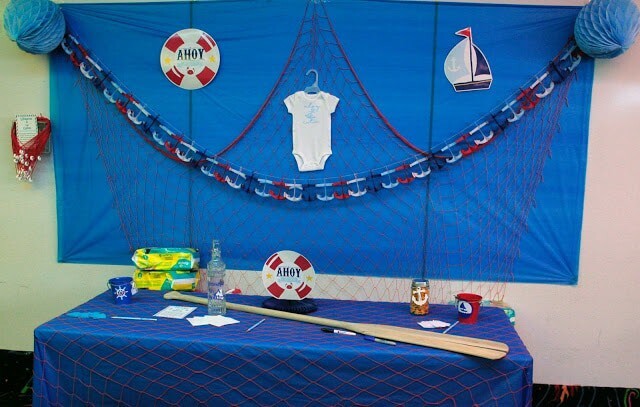 What do you think of this ahoy its a boy Oriental Trading baby shower? 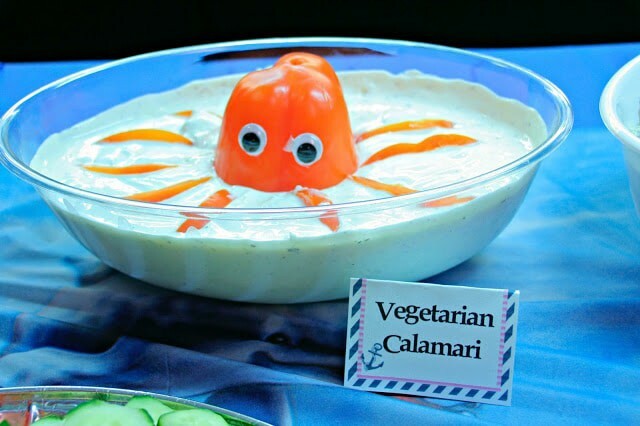 Interested in other party decoration inspiration? Check out our Oriental Trading Easter Table setting. 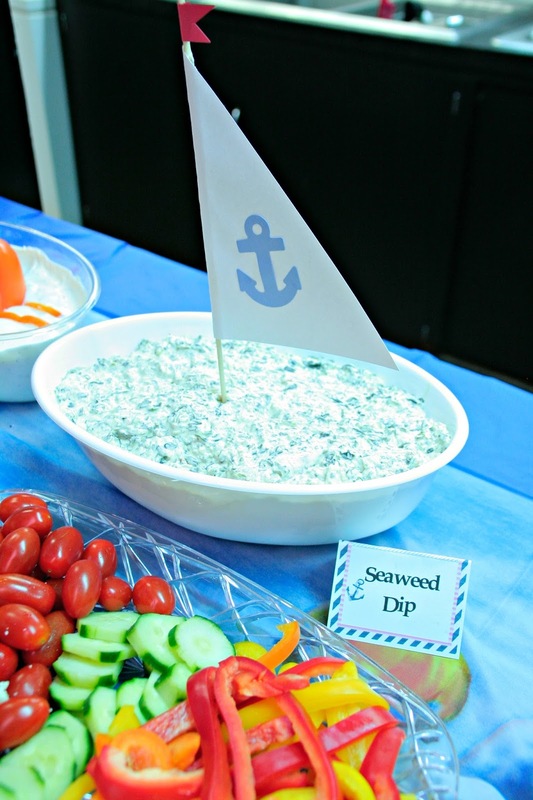 I love what you did for the nautical baby shower. 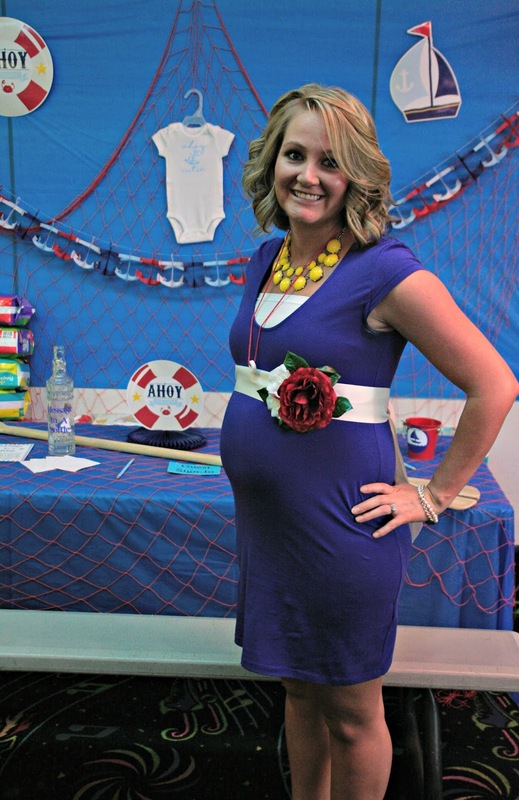 I am doing the same theme for my daughter’s baby shower, and I have some questions about the necklace game. How many necklaces do I need to make for 40 people and where did you get the life savers? I would appreciate it so much if you would get back to me soon. Thanks for commenting. We had one necklace for every person that attended, so if you plan on 40 people, make 40 necklaces. Also the lifesavers were bought at Walmart in the candy aisle. The come individually wrapped, so you have to take them out of there. You can also grab them from my amazon affiliate link here https://amzn.to/2AYaFXP. Have a wonderful time and congrats on the grand baby!